Does ‘Drink to Thirst’ Hydration Work For Endurance Athletes? Many coaches and athletes have come to support a theory that drinking only water, only when you feel thirsty, is enough of a hydration strategy to keep you performing at your best during endurance events. But prevailing exercise science touts the importance of methodically replacing the electrolytes lost in our sweat. Where did ‘Drink Water To Thirst’ Come From? In 2012 Dr. Tim Noakes (South-Africa-based emeritus professor, prominent sports scientist, and ultra-marathoner) published a controversial book titled Waterlogged—The Serious Problem of Overhydration in Endurance Sports. Noakes was motivated by years spent studying instances of athletes becoming very sick or even dying from the overconsumption of water (and diluted sports drinks) during competition. 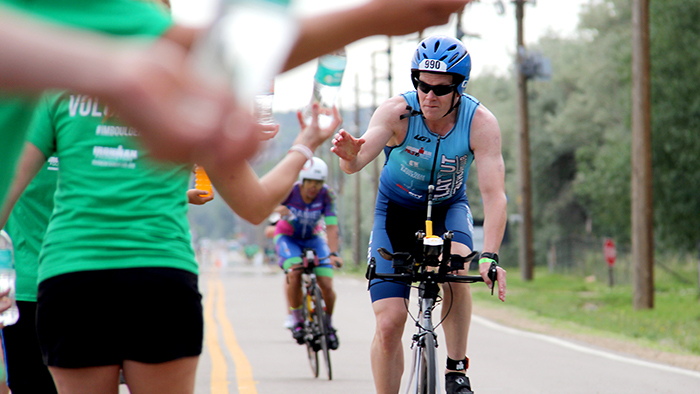 Endurance athletes are susceptible to a condition called hyponatremia, which occurs when blood sodium levels become diluted below a critical level. It’s usually caused by drinking too much water without enough electrolytes (more on this later). Once thought to be an extreme scenario, a recent study showed that more athletes suffer complications from hyponatremia each year than from dehydration. In his book, Noakes is adamant that the sports drink industry (particularly one well-known brand that starts with G and rhymes with ‘lemonade’) is to blame for the problem. He suggests that the industry has mis-interpreted research findings (willfully or otherwise), encouraging athletes to drink ‘as much as is tolerable’ during exercise. The industry does this, Noakes says, not because it’s best for performance but simply because it sells more drinks. Noakes contends that drinking water ‘to thirst’ (instead of using a pre-determined strategy or consuming supplementary sodium) is not only the best way to avoid hyponatremia, but also to maximize athletic performance. He cites anecdotal examples from the early 1900s and into the 1970s, when athletes were actively discouraged from drinking during marathons and other endurance events, yet performed very well. He also interprets some of the existing research in ways that back up his claims. Overall, Noakes paints a convincing picture that simply drinking water when you feel like it is all you need to perform your best. However, it’s not unknown for Professor Noakes to take contrarian views on big topics in sport and exercise. In fact, he’s built a reputation and career by deliberately refuting ‘conventional wisdom’ (most notably with his contributions to high-fat, low-carb nutrition). For that reason, it’s important for athletes to consider the wider context around his stance. Possibly because of his longstanding reputation and previous success, Noakes’ strategy has received a lot of airtime. It’s gotten to the point where some within the athletic community consider ‘drink water to thirst’ to be some kind of universal truth; essentially all you need to know about hydration. Unfortunately I’ve also heard lots of (unofficial but credible) reports of athletes following a ‘drink water to thirst’ strategy in big races and ending up in the hospital with dehydration-related issues as a direct result. So let’s delve into the nuances of fluid and electrolyte intake for athletes, including the key theories of the ‘drink water to thirst’ argument. Theory #1: Drinking to thirst prevents hyponatremia. Takeaway: True, for most athletes in normal conditions. It seems to me that Noakes’ main goal with Waterlogged was to raise awareness of the dangers of hyponatremia in endurance athletes. In this regard, his ‘drink water to thirst mantra’ does make a lot of sense; it’s highly unlikely that anyone drinking water to thirst would become dangerously hyponatremic under normal circumstances. Sweat is ‘hypotonic’ to blood plasma (i.e. it is more dilute) so whenever you produce sweat you lose proportionally more water than sodium. As a result, your blood becomes saltier rather than more dilute as you start to dehydrate. Those rising blood sodium concentrations are a key part of what drives you to become thirsty. So if you drink water only in response to thirst, you should only ever dilute the blood back down to an acceptable level before the cycle repeats itself. You should never end up badly diluted (hyponatremic) unless you drink ahead of thirst (which would dilute your blood sodium more than necessary) or go for hours and hours drinking only water without replacing any salt. There may be some circumstances in which this theory doesn’t remain watertight (pun intended). Namely, when certain athletes (those with very high sodium losses, or ‘salty sweaters’) are doing long-duration exercise in the heat. These rare athletes are likely to be at an increased risk of developing hyponatremia even if they drink ‘moderately’. That’s because a very high rate of sodium loss makes it easier to suffer a relative dilution of sodium levels than when sodium losses are more modest. But in general, the idea of drinking solely to thirst seems an acceptable defense against hyponatremia in most cases. At Precision Hydration, we recently had the privilege to be involved in the publication of a pair of case studies in the British Medical Journal (BMJ) to highlight this idea, if you’re interested in finding out more. Theory #2: Drinking to thirst is how we evolved, so it must be best for combating dehydration. Takeaway: Sorry, but cavemen didn’t race Triathlons. Like barefoot running or paleo diets, ‘drinking water to thirst’ has been praised simply on the basis that ‘natural’ is ‘best.’ And while there’s a lot of merit in looking at our bodies through an evolutionary lens to better understand how they work, I think it’s willfully ignorant to gloss over the fact that what we often ask our bodies to do as athletes in the modern world is very, very different to what they were asked to do back in the distant past. For example, recent theories suggest that our ancestors may have engaged in ‘persistence hunting’ (the running down of prey animals on the hot African savannah for several hours in the heat of the day) drinking only—as Noakes describes in Waterlogged—water. But is that really comparable to doing an Ironman triathlon at 70% of your maximum heart rate, in a hot and humid environment, for 8+ hours until you collapse at the finish line? There is, I believe, a huge difference. The environment that we now enjoy in much of the developed world—specifically in terms of our free and ready access to water and salt—is also very different from that of our ancestors. It’s unlikely to find modern athletes as finely ‘tuned in’ to physiological cues like thirst (and a craving for salt) compared with times when resources were more scarce. And even if you are perfectly aware of your thirst signals (as a general rule, the elite athletes we work with are very in touch with their bodies), the demanding and complex nature of competition can make it difficult to find physically and tactically ideal moments to hydrate. I believe that, while it doesn’t hold all of the answers, modern sports science has a lot to offer when it comes to hydrating to maximize performance. Theory #3: Drinking to thirst removes the need for sodium supplementation. Takeaway: There’s a reason succesful athletes hydrate with electrolytes. Where I think the ‘drink water to thirst’ argument has been stretched thinnest is in the assertion that it’s optimal for maximizing human performance in any scenario—something that is expressly promoted in Waterlogged, and by the keenest ‘drink water to thirst’ advocates. Drinking water to thirst is very likely sufficient for short and light activities where sweat losses are low to moderate, but the data is a lot less clear for longer and hotter events, where sweat loss can be considerable over many hours. The data is more clear when it comes to athletes using sports drinks during hot, long races with great success—like Comrades Marathon winner Arthur Newton, who used a homemade concoction made of lemonade, sugar, salt and bi-carbonate of soda, aptly-called ‘The Corpse Reviver.’ Newton was clearly not being paid to promote this ‘product,’ yet continued to use it for many years. It was even copied by many of his competitors, presumably because it worked. More recent research showed that triathletes who were given salt tablets (vs. a placebo) during a middle distance race were ~26 min faster on average. The study also showed that the group taking salts rehydrated more effectively than the control group. This certainly tallies with my own experiences using sodium supplements during long, hot races. It also seems to validate what we see in “the real world” with the large numbers of endurance athletes who seem to benefit from taking supplementary sodium during events. Sports drinks are arguably overused by a lot of people, but they have been proven time and time again to provide performance-enhancing benefits to athletes (and humans in general) in the right scenarios. …you’re training or racing shorter hours/distances in cooler conditions? There are lots of scenarios where just drinking water to thirst is sensible, like for basic day-to-day hydration. And for many people training or racing shorter events in cool to moderate conditions, drinking water to thirst will be sufficient most of the time. There may be some benefit to having a basic hydration plan to follow, or in taking steps to ensure you start properly hydrated. But, basically listening to your body (and making sure you have fluids readily available if needed) ought to be enough to guide your fluid intake—even if you don’t get it quite right, the consequences are likely to be quite limited for a short event; fluid and electrolyte homeostasis (or balance) is likely to be achieved naturally in the hours after you finish sweating. …you’re training or racing longer hours/distances in tougher conditions? However when you’re sweating over many hours (either in a single day, or collectively over many days back-to-back) and accumulating large sweat and sodium losses in a condensed period of time, I remain wholly unconvinced that drinking water to thirst is enough to optimize your hydration and performance. There’s just too much solid evidence out there showing athletes at all levels using electrolyte supplements to very positive effect (and the opposite when they don’t). If you’re training/racing longer distances, especially in hotter/more humid conditions, it’s definitely worth building a considered hydration strategy. Your plan should be individualized and flexible enough to be tweaked on the go. It should also utilize biofeedback (including a big reliance on your sense of thirst) to determine how much fluid and sodium you take in. Taking this free online Sweat Test can help you get started. In reality most people’s final hydration plan should involve some strategic and premeditated consumption of fluids and sodium, balanced with a healthy degree of ‘drinking to thirst’ to ensure that you don’t end up vastly over (or under) doing your intake on a given day.